Luxury of Rosemary without the prices! 20 yards to the Beach Boardwalk. We want to make your vacation a truly relaxing getaway from the very beginning, and this home was designed with our vacationers in mind! Upon entering this beautiful home, conveniently located is the mudroom to toss off your flip-flops. There's even a full closet to hang your extra large beach bags! Walk up the beautifully wooded staircase, to the 2nd floor and enter the beach chic styled main living area. All furnishings designed with the ultimate dream vacation in mind! Gorgeous decor with crisp white walls and sea foam green & blue accents create an instant feeling of luxury at its finest. There is a spacious private balcony with plush patio furniture and a fabulous peek-a-boo gulf view! I can assure you this will be the spot where many memories will be made! The living room, kitchen, and dining area are all located in one spacious area, making it the ideal spot for everyone to come together. Your fabulous kitchen comes fully equipped with all stainless steel appliances, gorgeous white marble countertops, & breakfast bar seating for four. Off the kitchen to your right is a gorgeous wood dining table with seating for six. Open the sliding patio doors for some fresh air during your meal! The hallway guest bathroom may be the coolest one you will ever see! Sea foam green and white ocean waves themed wallpaper and the glass bowl sink will not be forgotten. You may even find yourself recreating it in your own home! The 3rd floor has 2 gorgeous guest bedrooms and full laundry room with side-by-side washer/dryer for your convenience. To the left of the hallway is the first guest bedroom with a queen bed, flat-screen TV, and private connecting bathroom with a full soaking bathtub, perfect after a day at the beach! You even get your own private balcony when you want some alone time. The second guest bedroom will be the kids' favorite with 2 custom built bunk-beds. Three of the four beds are twin-sized, and one is a queen. This makes it convenient for families who need to sleep in the room with their children or teens who prefer a larger bed. There are plenty of drawers built right underneath for storing all of your flip-flops and bathing suits. The kids will love the large flat-screen TV for their use only! This bedroom also has a full connecting bathroom with a beautiful stand-up tiled shower. The stunning spiral staircase leads you up to the 4th floor master suite. The entire floor was designed for its guests to experience the true meaning of luxury. This room has its own private balcony with breathtaking views of the Emerald Coast waters. A plush size king bed, a large flat-screen TV, and a stunning full spa bathroom with a large soaking tub, separate shower, and double vanity; this floor is truly Heaven on Earth! You may find yourself never wanting to leave! This beach home also has 3 private parking spaces. A major bonus around here due to limited space. The best part? There is a private beach access located right next to your house! Come stay at this incredible Gulf view beach home. Make wonderful memories you will cherish for a lifetime! 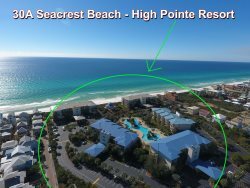 It was excellent, the access to other amenities such as shopping, groceries, boutiques was all within walking distance and the best was the beach only a few steps out the door. Very nice and very reasonably priced. Ricki was our contact and she answered all of our questions promptly. We loved everything about the property and location. We stayed at 244 Winston and the house had all the amenities we could want and more. Our favorites were the ease of access to the beach and that our area was not crowded. We also loved the very short bike ride into town for shopping, eating and outdoor concerts. The kids favorites were The Sugar Shack, La Cocina Mexican restaurant and Shades. Our entire experience was wonderful and we are looking forward to returning again soon. It was a little slice of heaven!